Established for more than 30 years, we are a local company, serving North Somerset, Somerset and Weston. We pride ourselves on our specialist knowledge of Garden Machinery, and much more. We have a vast range of product knowledge and employ factory trained technicians full time, and all work is carried out in our own fully equipped workshop. We strive to provide our customers with a fantastic, hands on service, and with our experienced and professional technicians, we can give our customers the type of garden machine they need from our great service. Mowers, chainsaws, brush cutters, strimmers, ride-on mowers, lawn tractors, hedge trimmers, leaf blowers, scarifiers and other associated equipment. Naturally, we supply all necessary safety equipment and protective clothing. 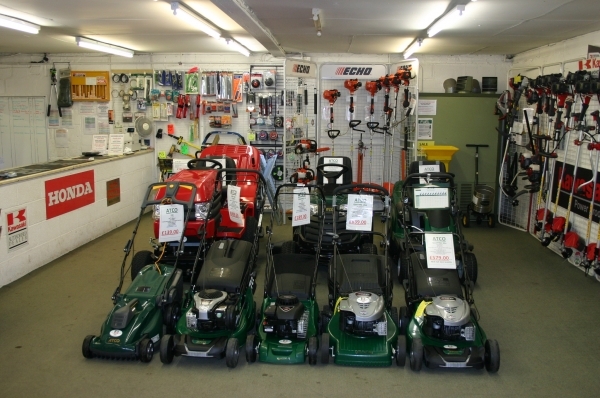 As well as various garden machines for sale, we offer our customers a number of different benefits to shopping with us, including a full manufacturer’s warranty repair service, numerous services and repairs for a number of different makes, and high quality and reliable spare parts. Fuel cans, 5ltr plastic,5ltr metal,10ltr metal,20ltr Jerry cans. 2 stroke mixing bottles, 2 stroke oil measuring beakers. Range of Rock lubricants, 2stroke,4 stroke & Chain oil and LM grease tubes. WD40,3in1 oil, straight SAE30 engine oil. Strimmer & Brushcutter Harness's, combi face & ear protection (mesh & clear poly-carbonate), leg spats.goggles & safety glasses. Please call in to the shop or telephone 01934 852151 today for help in choosing the correct equipment for your needs. We strive to make our services as convenient and useful as possible for our customers. Alternatively, if you can’t visit us or contact us via phone, please visit the Contact Page, and complete the online form.